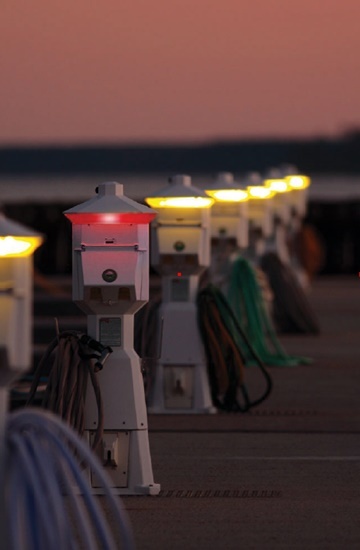 The flashing red light of the Eaton ground fault pedestal lets marina staff know that power has been disconnected. Marinas are in the hospitality business and, regardless of the size or scope of facilities and services on offer, every good marina team seeks to offer guests the best experience. Boating and other recreational watersports are a hugely popular, family-friendly way to relax, socialise and interact with our beautiful natural world. Boating is fun but we need to make sure it is also safe. Over the past 30 years, most of us have read a news report of an Electric Shock Drowning (ESD) at a marina. More than 70 ESD deaths and 100 injuries have, in fact, been reported during this time at freshwater facilities, and other casualties have probably been misclassified. These are serious or even tragic incidents – but, the good news is, they are preventable. We need to understand why electric shocks can occur in the water so that we can put proper precautions in place to safeguard marinas for everyone to enjoy.